Too bad I just never use ribbon in my scrapbooking. 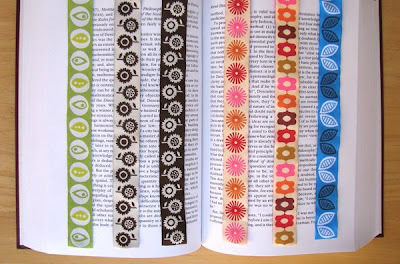 I am making some cards for christmas and am trying to use up some of my stash of ribbon and it's rather slow going! useless ribbon...my eyes! you are so talented beyond fairness...I love everything you do and can't wait to get my hands on some of that!! Oh my goodness! I love these! Can I put in a request for some wider ribbon? I could see really cool aprons with these! The ribbons are great! I might secretly love the pea pod. Guess that's not a secret anymore. Stop now! I beg you! I am going to have no money for food or shelter. My faves are the B&W sunflowers. Hi, Mumsy. I'm reading Grace Eventually by Anne Lamott. Oh, did you mean what's the book in the photo? :) It's a philosophy book. That's the Descartes section. I needed a fat book with no pictures and small type. The ribbons looked like bookmarks to me, so I wanted to shoot them that way. Does it look interesting to you? Want to borrow it? watchoo talkin' 'bout willis? these are great!! love 'em! Well, I won't stop you. Ooo, would make very pretty wrapping on xmas gifts in kraft papers. Or hair decor for those with long locks. Trim a few lamp shades or roller shades. Make one of those french message boards with the criss-crossed ribbons. Hang holiday cards from strips of this mounted on a wall or door with a push pin. Whoa. You're a good salesman. Awesome ideas! Is there any place I can buy your ribbons or fabric other than jcarolinecreative? Their shipping cost to Australia is outrageous. $45 for 2 metres of ribbon? Do you have an etsy shop or equivalent? wow. those are really pretty! now don't you like ribbon? 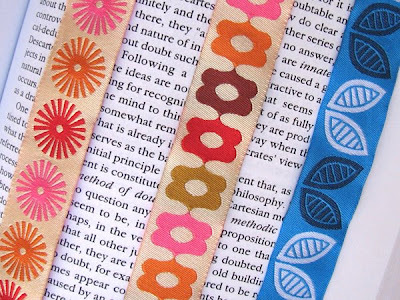 I like these prints as fabric, but I LOVE them as ribbon! 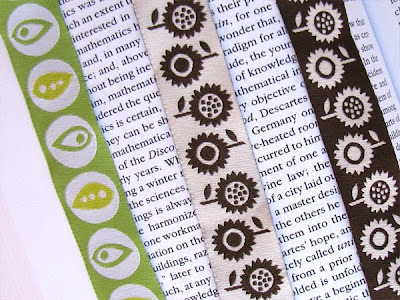 I rarely buy ribbon, but I think I might need to get me some of these! OK..don't take this the wrong way, but I think I like the ribbon even better than the fabric. I've used your peapod fabric and actually that whole first collection quite a bit. I'm ready for new ideas and then BAM, here comes ribbon. I think it'd be great to trim things that are next to my fabric projects. Whee! **drooling slightly*** Methinks I must make a dog collar with this ribbon!!!! I want them ALL! Yum. Can I ask you who you use to create them? I'd love to make some special ribbon just for my business. LOVE THESE!!! Nice work (as always) Jessica! Your stuff is always beautiful! Kat, JCaroline arranged the printing, and I don't actually know which vendor they use or what the minimums are. Sorry I'm not too helpful. And regarding international shipping, for anyone who wonders... JCaroline Creative has their site set up to estimate shipping costs for checkout purposes, and the actual shipping is often much less than what's quoted to you. If your ribbons fit in a flat rate envelope, they can ship them for $11.35. They charge you whatever the actual shipping cost ends up being. If you have questions about what the actual shipping cost will be to where you are, email them for more information. Hope that's helpful. Love the ribbons! Must resist adding to my stash! Augh but I can't! The ribbon is wonderful! I love ribbon and its best role is just adding a bit of fabulousness or refinery to just about anything :). I make kid's clothes so THANK YOU! for coming up with some ribbon designs that don't make me cringe. this one looks really nice! wow. they are good! do you have other designs? the second and third ones....LOVE!! I 'm definitely going to buy some really soon. I can't wait. so yummy. . . my little girl probably needs some so her mama can embelish skirts, jumpers and her hair. Could you please make ribbon with tropical fish next?